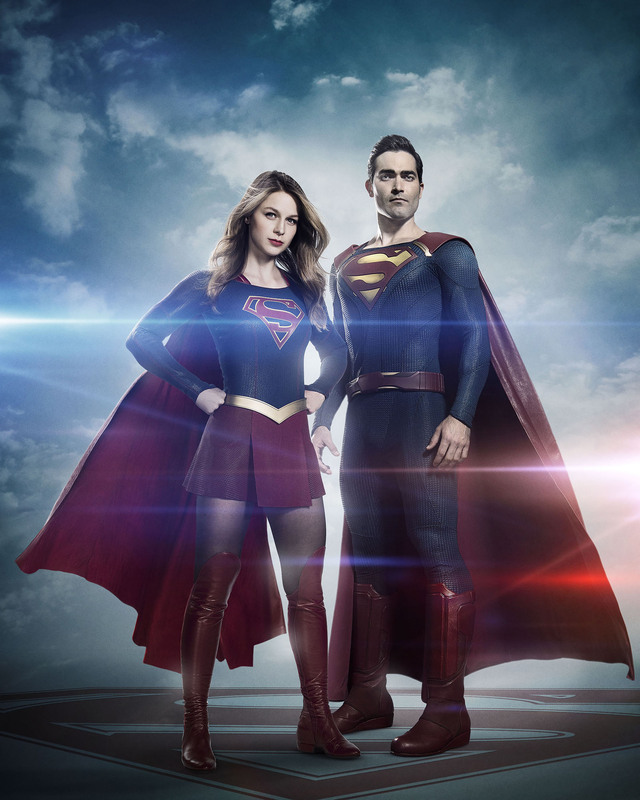 The CW has unveiled the first official photograph of former Teen Wolf star Tyler Hoechlin as Superman alongside Supergirl herself, Melissa Benoist. And we have to say that it’s very cool to finally see the Last Son of Krypton with the Girl of Steel in live-action! Kiersten Ronning designed this version of the Superman costume, which seems to invoke the character’s New 52 costume. Superman was alluded to several times during the first season ofSupergirl, and he was even briefly glimpsed on more than one occasion. But now Benoist’s Kara will finally get to interact with her famous cousin for at least two episodes, starting with the second season premiere of Supergirl on Monday, October 10. Story details about Superman’s guest appearances haven’t been revealed, but it is known that Hoechlin will also appear as Clark Kent, Superman’s secret identity and he will share at least a few scenes with Mehcad Brooks‘ James Olsen. Perhaps the Man of Steel may have a few words to share about his friend kissing his cousin. Given that the Legion of Doom will be showing up on DC’s Legends of Tomorrow, Arrow, and The Flash as well as Supergirl, perhaps Hoechlin’s appearance on this show would also be a good time to introduce Bizarro, Superman’s sometimes evil doppelganger. And if Superman himself is no longer off limits for Supergirl, can his nemesis, Lex Luthor be far behind? What do you think about Hoechlin’s new Superman costume? Embrace your inner fashion critic in the comment section below!